Before anything else, I’d like to greet you all a Happy Valentine’s Day in advance. Since that day falls on a Tuesday, I’m sure many couples out there would celebrate it this coming weekend. What about for those uncommitted? Do they have to wallow in despair because of solitude? No. Facebook has a solution for that! The other night, while Facebooking in Mozilla Firefox, I saw this cute advertisement in the upper right corner of my Timeline. It says: “No girlfriend yet? Get serious about a relationship and sign-up for free at FlirtMax.PH. 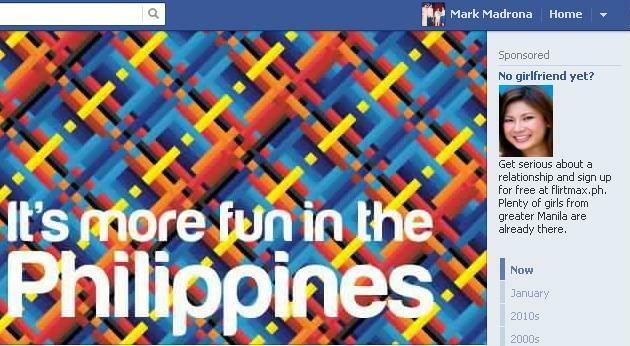 Plenty of girls from Manila are already there.” I’d like to note that I didn’t see this ad when I used Google Chrome.